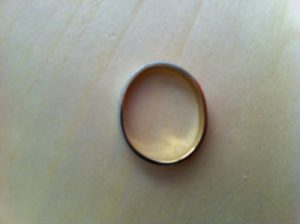 People who are not accustomed to wearing rings often prefer comfort fit bands, as do people with larger ring sizes and people who do a lot of work with their hands. So, we have a lot of men who prefer comfort fit – but also a lot of smaller women. 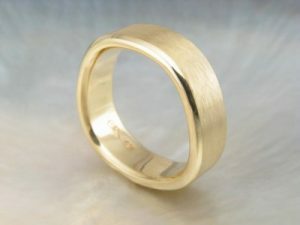 Some people, however, don’t like the extra thickness because they feel like it makes the ring too bulky. 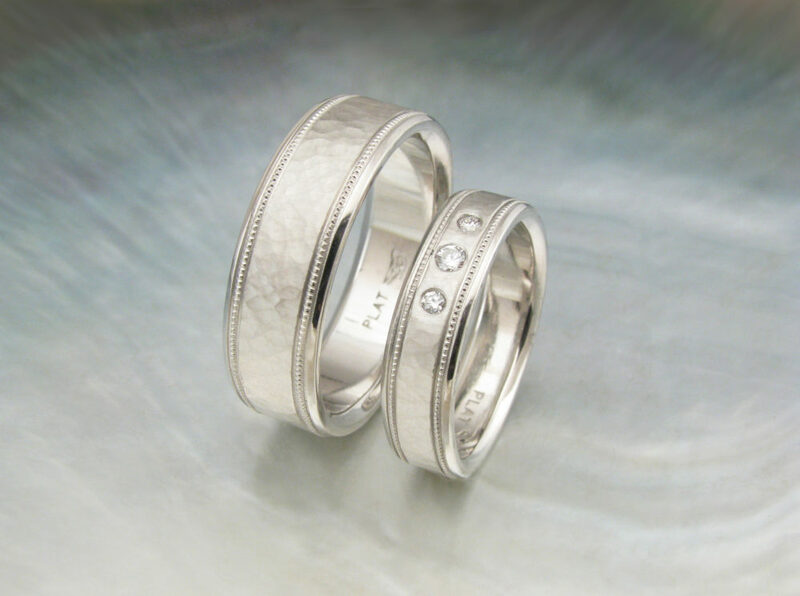 It’s much easier to feel the difference of comfort fit bands than to understand it cognitively, so we recommend going into a couple of jewelry stores and trying on some bands to see what feels good (which gives you an opportunity to confirm your ring size, as well). 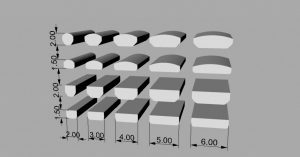 In Figure 2, Dan modeled several different widths. 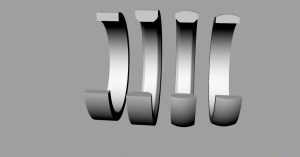 The widths of the bands are shown at the bottom of the rendering, and the thicknesses are shown on the left side. The 2mm thickness allows for the comfort fit. The two rows on the top are of half round bands in varying widths, with the top row being comfort fit and the second row being non-comfort fit. The two rows on the bottom are of pipe bands in varying widths, with the third row being comfort fit and the final row being non-comfort fit. Finally, Figure 3 shows two comfort fit bands – pipe style on the left; half round on the right. “Comfort fit” is a term that gets thrown around rather loosely and is therefore confusing. Some people have the misconception that a half round or domed band is synonymous with a comfort fit band. It is not. Either a flat band or a domed band can be made comfort fit… what is necessary is a thicker shank in order to accommodate the bevel on the inner edges of the band. Rings that are marketed as “comfortable” are not necessarily comfort fit (even though they may well be comfortable). Another misconception with respect to comfort fit bands is that a person’s ring size will change depending on whether the ring is a standard band or a comfort fit band. In fact, ring size should stay the same, regardless of whether the profile is comfort fit or not. A comfort fit band will go over the knuckle more easily, but the size of the finger where the ring will sit is a constant. Finally, some people label comfort fit bands “Euro fit.” The original Euro-fit bands (also called ergo bands or ergonomic bands) were somewhat square in shape, and therefore “comfortable” in the sense that the bands did not spin around the finger or catch on things. Many retailers now use the term “Euro fit” and “comfort fit” interchangeably. 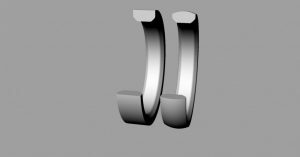 The band in Figure 4 is both a Euro fit ring with a soft, square shank and a comfort fit ring with rounded interior edges. Ultimately, the decision to go with comfort fit or non-comfort fit is a matter of personal preference and budget. The best way to determine which style is right for you is to try several rings on to see what you like.